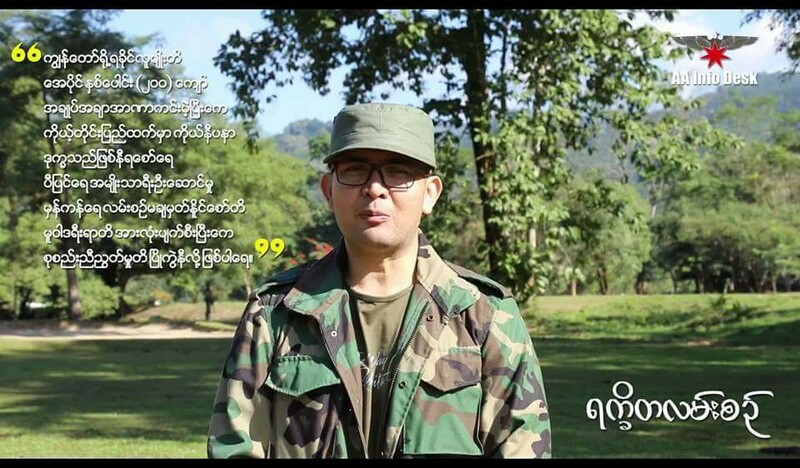 The head of the Arakan Army (AA) has called on the Arakanese people not to let their emotions lead them to become involved in the conflict in Rahkine State. AA chief Tun Myat Naing spoke for 20 minutes in a video posted on the AA’s Facebook page in which he described the conflict between Muslims and the Myanmar Army in Rakhine as a “political trap.” The video has attracted more than 200,000 views. “The enemy has surrounded our Arakan land,” Tun Myat Naing said, referring to the Myanmar Army in Rakhine.“There are many conflicts in Arakan. For example, the problem of the Kalar (a derogatory term used against those of South Asian descent, and increasingly as an anti-Muslim slur) is a political trap for us. It has divided our people. We give warning to our people. This is a sensitive issue, and we should not become involved emotionally,” he said. “Whenever there has been a conflict with the Kalar, they [the Myanmar Army] have wanted to create a split between the AA and the world. They have tried to lead us into an international trap,”he said. Tun Myat Naing said he had warned the leaders of the AA as well not to become entangled in the “Kalar conflict.” “The Myanmar Army is the only party mixed up in this fight. They are the ones who took our land and our natural resources. They are the ones who are involved in this current conflict. But, they have tried to trap us and drag us into it as well,” he said. The AA intends to protect the land of Arakan and the Arakanese people, but the rebel group will stay on the sidelines whenever conflict breaks out between Muslims and the Myanmar Army in Rakhine State, he said. “This has prompted some people to criticize the AA. But we need to be careful with our political stand. They [the Myanmar army] attacked those Kalar with the intention of protecting the land for themselves and to keep it for themselves. It was not to defend our people. Our people must understand this,” Tun Myat Naing, said. The AA chief said that some people have come to question the AA, asking why it had not returned “to protect our land.” “For our side, we have enough armed forces to protect Buthidaung and Maungdaw even though we do not have enough to protect the whole of Arakan,” Tun Myat Naing said. “When our AA did not get involved in the Kalar conflict, to avoid this trap, some of our people may have misunderstood our viewpoint.” He said that some Myanmar military leaders who were also members of the government had repeatedly claimed the AA had an alliance with the Arakan Rohingya Salvation Army (ARSA), the Islamist group whose attacks against government outposts in August triggered the latest crisis in Rakhine. “They do not have it in their minds to solve this conflict, which needs a political solution. They stir up trouble all the time as they do not want to solve this political conflict through political means. For our Arakanese people, we need to solve this conflict by staying united. We need to overcome this problem by working together as a unified force.” The AA is an armed ethnic group has its origins in Rahkine State, but is based in Laiza in Kachin State. The AA established an armed force in 2011, and has said it planned to return to its homeland since 2014. The AA has widespread support among the Arakanese despite a crackdown by the Myanmar Army that has seen dozens of people arrested and imprisoned on charges of unlawful association. Since they were formed as an armed group the AA’s stated intention has been to return “the motherland” to the Arakan people. It has used the Paletwa region as a staging area for its operations. Tun Myat Naing asked his Arakanese people to treat ethnic Chin people who live on “Arakan land” better despite the Chins dislike for his army’s base in Paletwa. “Paletwa is an important territory for the AA as we have our political base there, and we can get food for out troops to survive there. It is important to avoid having conflict or arguments in the area. We should not attack ethnic Chin people who stay in Arakan. We should all stay united and stay together with them. We need to treat them like brothers. There are bad and good people in every ethnic group. The Chin who stay in Arakan do not have to be worried about their security,” he said. Fighting between the AA and Myanmar Army broke out in Paletwa and Myeik Wa near the Indian border in the first week of November, and has continued for 40 days, according to the AA. “Our Arakan dream is that we will take back Arakan in 2020. This message is for our people. Everyone needs to have this dream. It is important for our people to follow your duty to fight to take back your land. It will not be easy to win back our land and to build a new home. We need to do it systematically,” Tun Myat Naing said.